Phil Taylor booked his place in the PDC World Championship final after fourth seed Gary Anderson beat defending champion Michael van Gerwen. 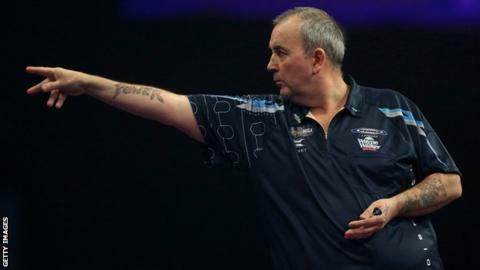 Taylor, 54, the 16-time champion, eased through 6-2 against former winner Raymond van Barneveld at Alexandra Palace. Scot Anderson beat Dutchman Van Gerwen 6-3 to reach his second world final. "The more pressure I put on him the more he missed," Anderson, 44, told Sky Sports. Anderson finished with a 50% checkout success and a three-dart average of 102.2 against his younger rival, who missed four darts to take a 4-3 lead after fighting back from 3-1 down. Taylor raced into a 2-0 lead against Dutchman Van Barneveld, only for the 14th seed, who beat Stephen Bunting in a thrilling quarter-final on Friday, to level at 2-2. But Taylor dominated the remainder of the match to reach his 20th in total. "It was a bit of walk in the first two sets and then he came back and it was nip and tuck," he said. "I thought to myself, 'You're in the semi-final, come on' and I pushed on a bit."